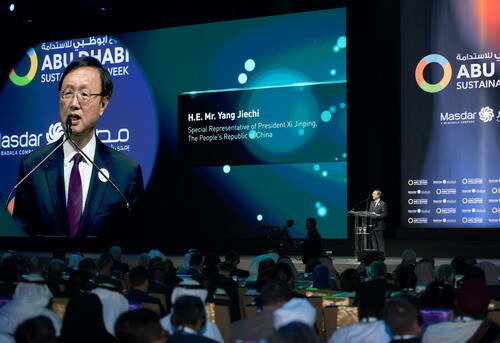 On January 14, 2019 local time, President Xi Jinping's Special Representative, Member of the Political Bureau of the Central Committee of the Communist Party of China (CPC) and Director of the Office of the Foreign Affairs Commission of the CPC Central Committee Yang Jiechi attended in the United Arab Emirates (UAE) the opening ceremony of the12th Abu Dhabi Sustainability Week and the award ceremony of the Zayed Sustainability Prize and delivered a speech. Yang Jiechi first congratulated warmly on the convening of the event on behalf of President Xi Jinping. Yang Jiechi expressed that President Xi Jinping pointed out that ecological conservation concerns the future of the humankind and it's the common goal of all nations to build a green home. The international community should enhance cooperation and make concerted efforts to push for the realization of sustainable development in the whole world. Guided by the conviction that lucid waters and lush mountains are invaluable assets, China advocates harmonious coexistence between humans and nature, and sticks to the path of green and sustainable development. Promoting green, low-carbon and sustainable development has become China's own needs to realize its economic transition, and a major way to nurture new growth drivers for global cooperation as well as the responsibility for building a community with a shared future for mankind. Yang Jiechi pointed out that China and the Arab States are natural cooperation partners of the joint construction of the Belt and Road Initiative which sees sustainable development a core component. The Chinese side highly appreciates the UAE's efforts in promoting the building of ecological conservation and following the path of sustainable development, and is willing to make joint efforts with the international community including the UAE to comprehensively implement the 2030 Agenda for Sustainable Development, so as to join hands to build a clean and beautiful world. Yang Jiechi, together with other leaders, also presented awards to the winners of the Zayed Sustainability Prize. Established in 2008 and held regularly in Abu Dhabi annually, the Abu Dhabi Sustainability Week is a global event in the sector of renewable energy with a large scale and a huge influence. The award ceremony of the Zayed Sustainability is one of the supporting activities on the sidelines of the Abu Dhabi Sustainability Week.